The meter enables EasyPower to connect to on-line metering systems. Historical data stored in a database is displayed directly on the EasyPower one-line and stored in SCADA fields for analysis purposes. For meters, the program automatically assigns the names MET-1, MET-2, MET-3, and so on. Bus Conn The meter is connected to one end of an equipment item. This states the bus to which that equipment item is connected. Equip Conn This states the bus to which that equipment item is connected. 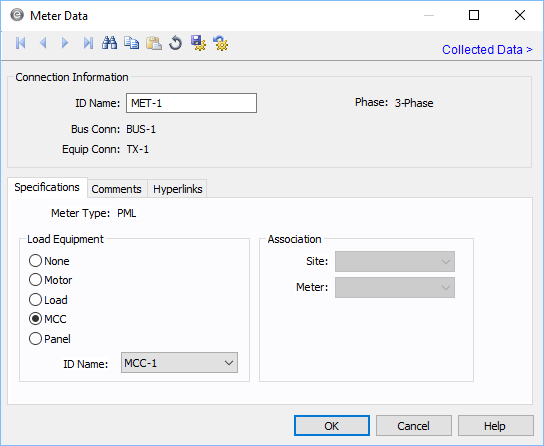 Unlike most equipment, the connectivity of meters cannot be changed from the Meter Data dialog box. The meter can be assigned to a particular motor, load, MCC, or panel. Selecting Motor places all available motors in the ID Name list. Multiple meters can be assigned to one motor, but only data from the last one assigned is saved to that equipment item’s SCADA fields. These options are not currently supported.